Silver Rocket Digital has released an update to the iOS version of the popular London Diving Chamber app, introducing the ability for users to backup their dives. 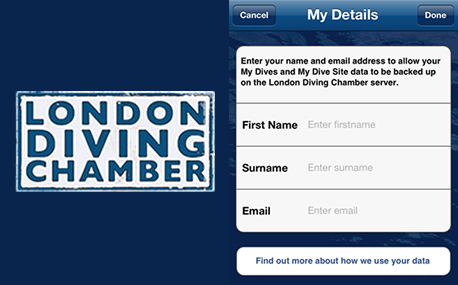 Upon updating the London Diving Chamber app on their device, users will be prompted to enter their name and email address, to create a profile to store their My Dives and My Dive Sites data against. In addition, a new button has been added to the home screen of the app, allowing users to “push” dive data from their device to the London Diving Chamber servers. At present the new synchronisation functionality only allows user dive data to be “pushed” to the server, but in the coming weeks a further enhancement will be introduced to both the iOS and Android versions of the app which will allow users to “pull” the data back to their device – this will be extremely useful if a user’s device is lost, stolen or the app is uninstalled, as entering their name and the email address used when setting up their profile will allow their dive data to be retrieved and added to a fresh installation of the app. The dive data made available to the London Diving Chamber will provide invaluable insight into not only how divers are using the app itself, but will also assist in understanding geographic locations where dives are being made, allowing for better planning of resources offered to divers by the chamber. The app can be downloaded from the iTunes app store.